I work with charities and small groups offering them my photography skills for free. It’s me paying back for the kindnesses shown to me and it’s sometimes good to get out and do the right thing for the right reasons. This was one such occasional we were asked to cover the launch of a charities 25th anniversary year and the launch of a campaign. 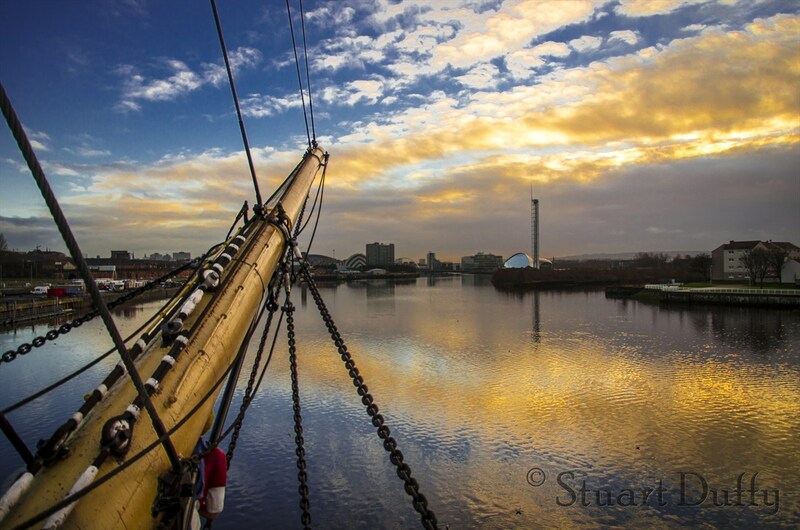 It was held on the Tall Ship next to the Riverside Transport Museum (they call it the Transport Museum in Glasgow). It’s permanently berthed and a charity on it’s own right. We arrived early and had some time to kill and the sun was just about to burst out of the clouds. Glasgow looked like it was still asleep so I looked down the Clyde and tried to imaging what it must have been like for the crew in it’s era, coming into the center of Glasgow, a very different Glasgow back then. The shiny building is the Science Center and the Tower is an observation platform, that never works! The ridged building under the Bowsprit is known locally as the Armadillo or nationally as the Clyde Auditorium. 40 years ago this was all docks and ship yards. The back of the ship is a completely different vista… that will be in the next posting!